From down the well: Who was your first? I know nothing of Cliff, but if you like him, I would go. My first record was probably early rock and roll. Really early. The best thing about this post is that I have learned some very interesting things about you that I did not know. I have no clue who Cliff is either, and as it's not a generational thing, it must be a geographical one. The first album I bought with my very own money was by "The Waitresses," and I was firmly ensconced in 80s music. However, 70s folk and rock had a place in my collection too as I had snagged several albums from my parents (to include the Beatles White Album). my first album was Meet the Beatles -- I was on my way to a classical music concert with my dad when I bought, and he was mortified. Eventually (around the White Album) he came around to appreciate them! My first album was something by ABBA. My first concert was Jesus Christ Superstar when I was ten (with Jon English and Marcia Hines). I have no desire to go to a Cliff Richard concert but enjoyed your story. Ooh, Helen, what a fascinating insight into your background. Hmm, Cliff Richard. I am 9 years older than you and have similar 'wired for sound' related memories, but I also recall him before the Shadows broke up. I don't think I would be seen at a Cliff concert, but you never know. I could be persuaded to accompany a friend, .... although not as far as Ireland. I do have a personal memory of Cliff Richard though. I used to work in a big posh trendy restaurant here in Perth Western Australia in the early eighties. He was in town and came to dinner, and I looked after his table. He was very courteous and friendly, and he had the grilled crayfish for a main course. My arm has brushed his. We have had unscripted conversation, and an informal laugh or two, on a purely professional basis. Fun, eh? As for my taste in albums, I used to receive albums for birthday presents and the like. I got one by a band called the Little River Band, Diamantina Cocktail, which I LOVED and played endlessly. I also was a mad Queen fan, and saw them perform live when I was 15y.o. My most recent concert was Michael Buble - who I THOROUGHLY recommend. What a showman, what a voice, swoon. My first concert at the age of 11 years was Cliff's at Southport. I went for a number of years - October time at Southport. One year I walked down to the front of the stage, while he was singing, holding a birthday card. He didn't take the card off me, so I left it on the stage and went back to my seat and once he had finished the song he thanked me! 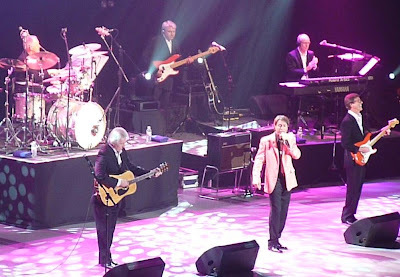 I have had to keep my Cliff concert going days to myself for a number of years - it's good to confess! Talking of confessions my first album was on tape format and it was...Leo Sayer's greatest hits! Not a great Cliff fan like you - Beatles and Stones more my thing - and I adored the Mommas and Poppas. But the first record I bought was believe it or not Living Doll by guess who! I think probably an LP of Vivaldi's Piccolo Concertos which had been the theme tune of "Listen With Mother" the previous week. I still have the lapel badge of a lute that the shop owner gave me! I'd go to a Cliff concert quite happily with someone who was a fan, but he was scarcely a soundtrack to my youth! My first album I paid for myself was Janis Joplin. First single was Rolling Stones. 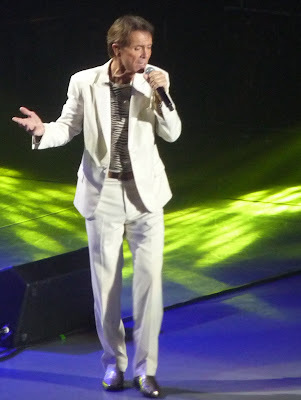 I wouldn't be seen dead at a Cliff Richard Concert. I never needed to play my albums backwards, as a Black sabbath and Deep Purple fan there was enough going on when you played them forwards. But my heart belongs to Sammy Davis Jnr. I rememberseeing him on TV as a girl and the first song I knew all the words to was the Candy Man. Well him and Steve Morse, the guitarist in Deep Purple, but that's a long hair thing. Never heard of Cliff, but my first concert was John Stewart who no one remembers. My first album was Sgt. peper which my brother gave me because he wanted to borrow it. My last concert was Sting and Annie Lennox at the Hollywood Bowl which was amazing. And Gerrie and Kristin are right, we really don't know you well at all! 1. I would not be seen dead at a Cliff concert although my best friend at school loved him. 2. The photos you have taken are superb - any I take at such events are shocking. 3. The first record I bought was by Donny Osmond! 4. I suspect my Dad was at that Billy Graham rally - he still talks about it now! 5. The last concert I went to was the 'Bad Shepherds' featuring Ade Edmondson singing punk in a folky way! "would you be seen dead at a Cliff concert?" It is the only circs in which I would be there! I was a Donny Osmond fan in my early teens and progressed to Yes and Led Zeppelin! Funny thing is, there are some people who you can't help but sing along with and Cliff's one of them. Well, as it happens, the first record I bought was indeed by Cliff. It was a 45 of "Please Don't Tease". When he was still being the British Elvis. I still have it and I still think it's fab. But I've never been to a live rock concert (only because I'm not happy in big crowds and a low noise tolerance) - one of those missed experiences that you slightly regret. 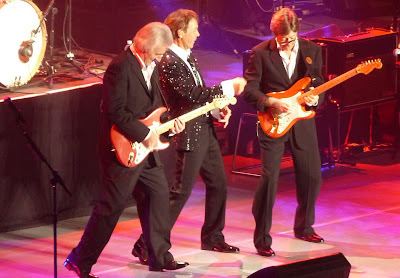 I was seen very much alive at Cliff's Sheffield concert last Thutsday and it was fantastic, I clapped my hands sore and shouted and sang my head off! 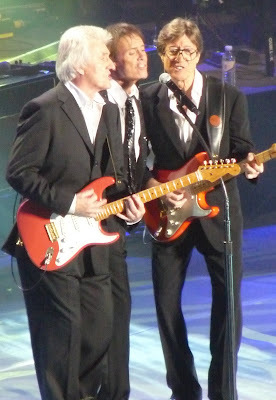 I have liked Cliff and The Shadows since the days of The Young Ones and love his music. I actually saw him when I was 18 at a Methodist Youth Club London Weekend when he performed for us at the Albert Hall. I only had a back view but I can still remember the thrill! You have to admire his vocal ability and stamina now and The Shadows sounded as good as ever.